Are you wondering how to teach a child to read? ABC See, Hear, Do is an amazing tool that works with kinesthetic, auditory, and visual learners! Kids learn better when lessons are tailored to their unique learning style. Is your child an auditory learner who learns better when hearing and saying things? Or, do hand motions and movement help concepts stick? Maybe, your preschooler learns better when they can see the concept for themselves. ABC See, Hear, Do is an innovative new method of teaching kids to read that makes learning to read FUN! I have two visual learners and a kinesthetic learner. My middle child is all boy, and he learned best by moving and doing. He despised flash cards and workbooks. There were weeks when I wondered if he’d ever learn to read well. If I had had access to a program like ABC See, Hear, Do when he was younger, I firmly believe he’d have found success much sooner. 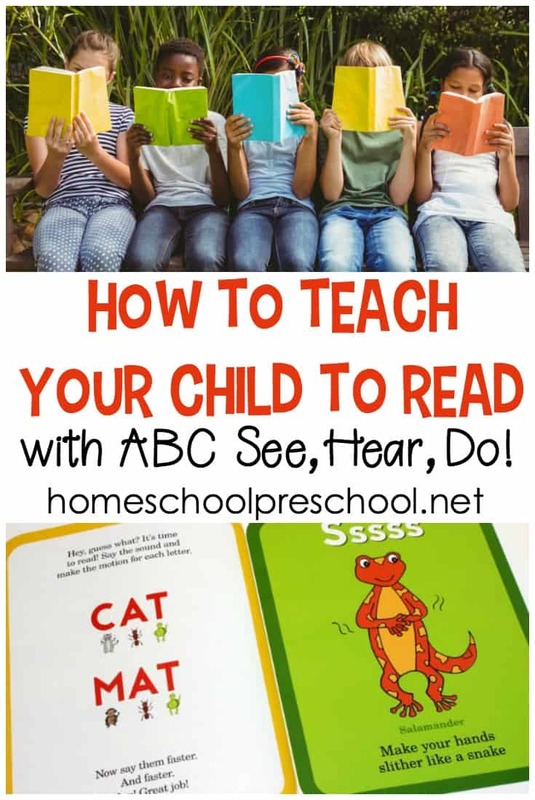 ABC See, Hear, Do introduces kids to letter sounds with large, colorful pictures that will capture your child’s attention as you turn each page. 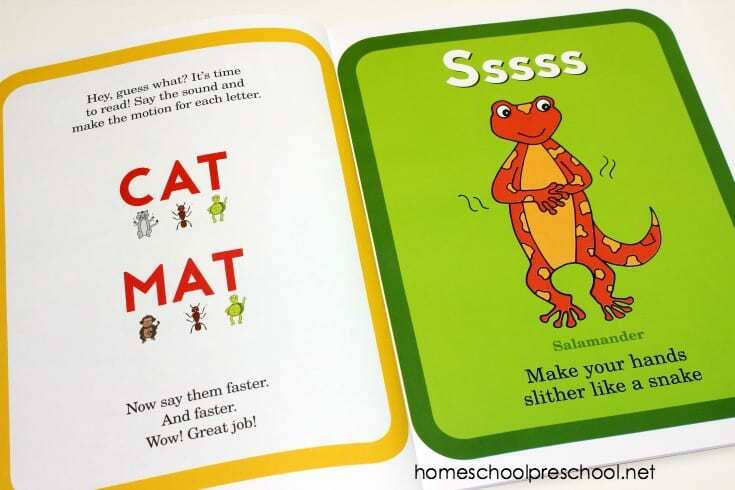 Each page features an animal or insect that begins with each letter sound along with images of the uppercase and lowercase letter. Each letter has one main image so the pages are clean and uncluttered. This is great for kids to be able to focus on one thing at a time. Auditory learners will enjoy the fact that ABC See, Hear, Do teaches letter sounds instead of letter names. This is important when children are learning to sound out words. They will see “C” and know it says /cuh/. Each letter/letter sound has an accompanying hand gesture or motion. Cc asks you to claw like a cat. Mm has kids rubbing their tummy like they ate something yummy. 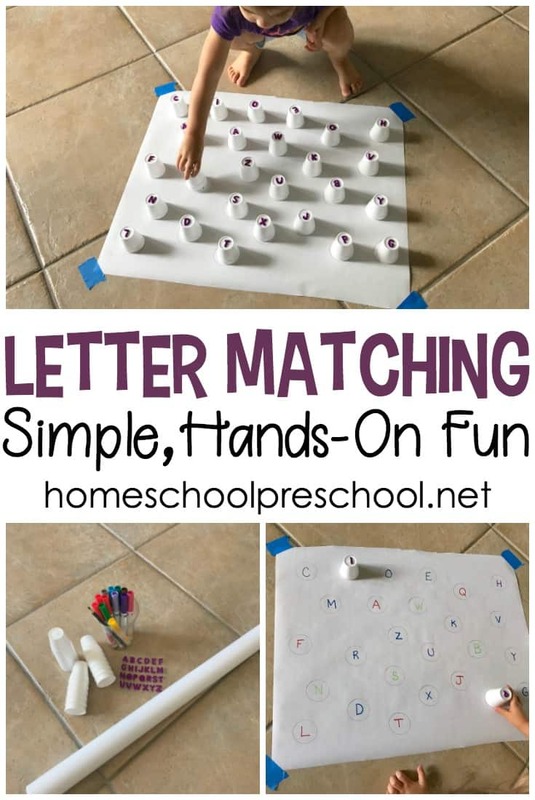 Kinesthetic learners will pick up on the hand movements and connect them to letter sounds making them stick. In addition to the books, ABC See, Hear, Do also has a coloring book and handwriting workbook that corresponds Book 1. 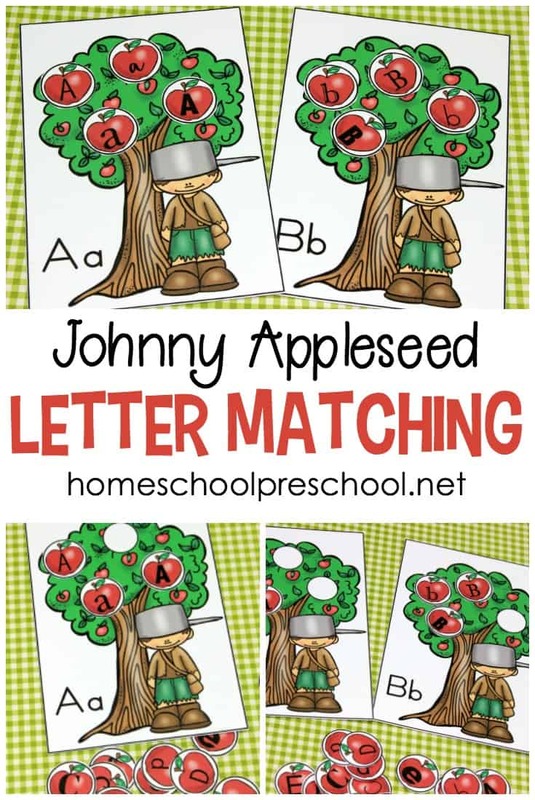 You can also download and print letter enrichment pages, wall posters, flash cards, and more! Book 1 features all 26 letters which are presented in a way that allows beginning readers to begin combining sounds into words after every fourth letter is introduced. This is great, because it gives kids something concrete to work with. They’ll love showing off their newfound reading skills as they master 55 CVC (consonant-vowel-consonant) words! Book 2 moves from simple CVC words to beginning blends. With the same style (image, sound, movement) as Book 1, kids will learn to read 51 MORE words. However, this book introduces a new sound/blend with a page of new words to read (instead of every fourth sound). Book 3 introduces blended ending sounds and another 51 words. Some of the words have beginning and ending blended sounds (chimp and shelf, for example). So, it’s helpful to use the books in order. 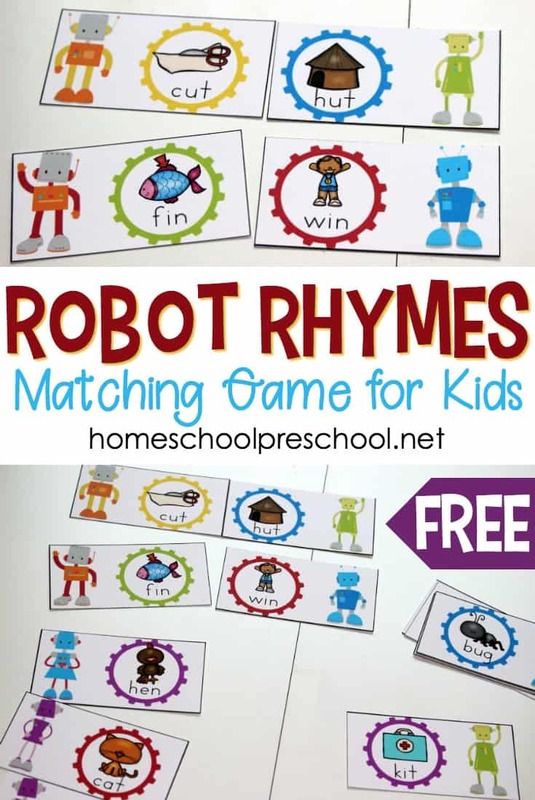 Would you like to try them with your preschoolers? 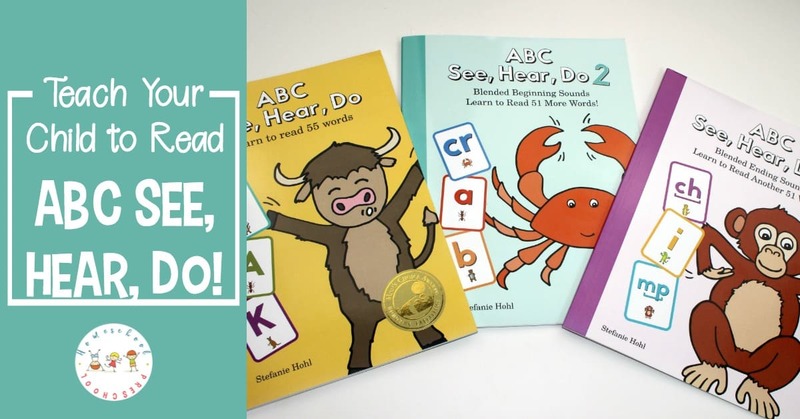 Stefanie Hohl, author of the ABC See, Hear, Do series, is giving away a set of her books to one lucky Homeschool Preschool reader. Enter below for a chance to win a copy of ABC See, Hear, Do Books 1-3! I would use these books with my 4 year old daughter! I would love to try these!!! I really think this would be very helpful for my son. He is struggling with reading. My son continues to struggle, so this would be helpful!